How to Repair Laptop LCD Screen? The important thing to note of the notebook is LCD screen part. Why do I say so? Because the LCD screen including perishable components, and spare parts at the market is still hard to find. But if your notebook's LCD screen was severely damaged and want to open it, you can start from studying its parts. If you are familiar with the components therein, then can be forwarded by opening the cover of the notebook. If the LCD screen successfully opened, one thing to note is part backlight must be maintained, because backlight is very easily to broken. Damage on the LCD screen is at most a dead backlight. The backlight can be replaced with accurate, in installing the cover also need a high accuracy. 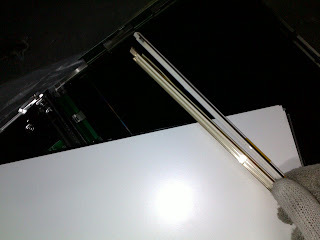 Another article about the laptop backlight/ LCD monitor backlight and how to change them, you can read here LCD monitor backlight.